Oct. 4, the Feast of St. Francis, marks the culmination of the Season of Creation celebrated by Christians around the world. Many churches observe the Feast of St. Francis as an opportunity to renew their commitment to care for what Francis of Assisi called "our dear Sister Mother Earth." On this occasion, some congregations celebrate a "Blessing of the Animals" when people bring their pets to receive a blessing, thereby honoring creatures in the way of Francis. 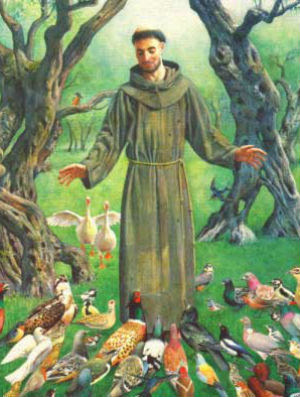 He held the animals with such deep respect that "Francis called all creatures, no matter how small they were, by the name of brother and sister, since he knew they had the same source as himself" (Bonaventure) - Sister Bird, Brother Wolf for example. He preached to the animals and even wanted the emperor to ask all citizens to scatter grain along the roads on Christmas Day so that the birds and other animals would have plenty to eat. Check out what you might do at your congregation by Clicking HERE for our full Menu of Actions. EmailBonnie Sorak or call her at 443-799-0349 for the details. Fill out this brief interest form and we'll follow up to schedule a conversation on your congregation's interests and capacity. October 25 BES Community Open House. Informal gathering hosted by Parks & People Foundation to share the research of Baltimore Ecosystem Study (BES). Free and open to all.5:30PM. Click HERE for details. November 5 Film "Merchants of Doubt" followed by a panel discussion, 3PM, Brown Memorial Park Avenue Presbyterian Church. Click HERE for more info. A One Water Partnership event.